NUNM’s Helfgott Research Institute is a professionally independent, non-profit research institute whose mission is to conduct rigorous, high quality, research on the art and science of healing, specifically working to understand natural forms of medicine. Together, scientists from the fields of naturopathic medicine, Chinese medicine, acupuncture, immunology, and nutrition apply their expertise to the study of natural medicine. Thinking about a career in integrative medicine research? Expand your skill set with a variety of educational opportunities! 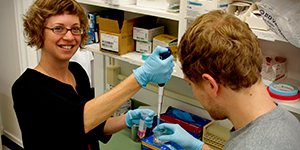 Post-Doctoral junior faculty level training is available through the BRIDG program. There are many ways in which Helfgott and NUNM reach out and connect with the local community and beyond. Take a look at our current research projects, including student led research and complimentary and integrative health research.